The Martha Stewart Living Country 3-3/4 in. 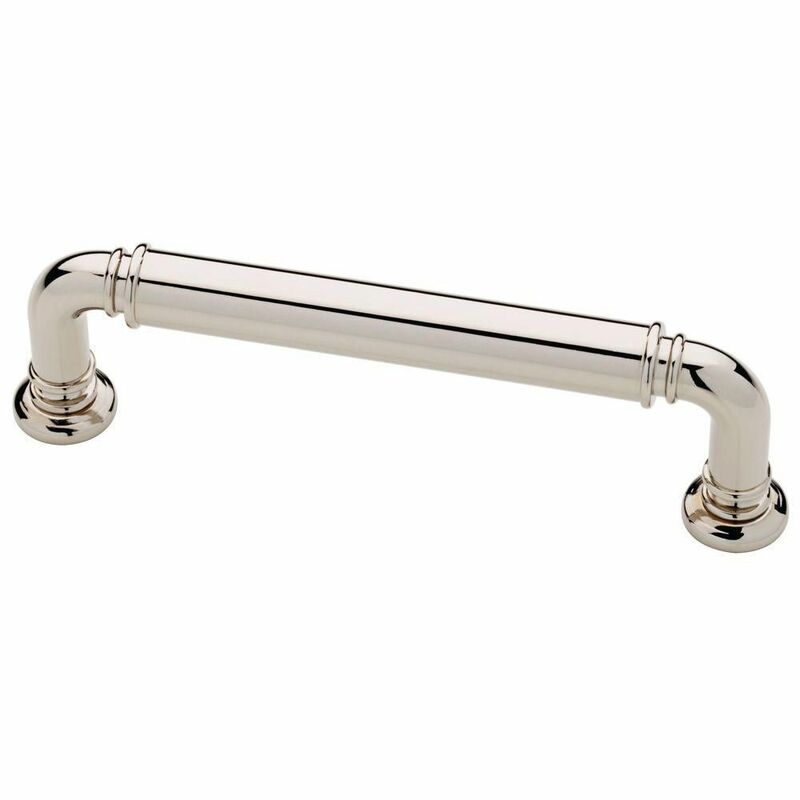 Polished Nickel Cabinet Pull is moulded from metal for durability and features a simple and elegant contour. Concealed mounting hardware is included. This pull is designed for easy installation. The Amerock BP40516ORB Bar Pulls 3-3/4in(96mm) CTC Pull is finished in Oil-Rubbed Bronze. Modern functionality meets straightforward styling. Simple. Bold. True. The sleek and sophisticated design of the Bar Pulls Collection makes a statement with clean lines and smooth textures. The Oil-Rubbed Bronze finish is a rich, dark brown old world finish with striking light and dark accents. The Amerock BP29355ORB Candler 3-3/4in(96mm) CTC Pull is finished in Oil-Rubbed Bronze. The Candler collection is distinctively elegant, with strong lines and soft curves that blend a touch of femininity with enduring class and timeless character. The Oil-Rubbed Bronze finish is a rich, dark brown old world finish with striking light and dark accents. The Amerock BP36584ORB Carolyne 3-3/4in(96mm) CTC Pull is finished in Oil-Rubbed Bronze. Elegant beading adds visual interest to our Carolyne collection; making each piece exquisite. Bright and polished or strong and subdued - you'll have your pick of gorgeous and stately finishes with this selection of knobs and pulls. The Oil-Rubbed Bronze finish is a rich, dark brown old world finish with striking light and dark accents. The Amerock BP29200G10 Conrad 3-3/4in(96mm) CTC Pull is finished in Satin Nickel. Inspired by recent resurgence of contemporary and transitional kitchen design, the Conrad collection's clean flowing lines merge with strong edges to create the perfect look for your kitchen or bath. The classic Satin Nickel finish provides a sleek, lightly brushed, warm grey metallic look. 96mm Bar Pull The Martha Stewart Living Country 3-3/4 in. Polished Nickel Cabinet Pull is moulded from metal for durability and features a simple and elegant contour. Concealed mounting hardware is included. This pull is designed for easy installation. 96mm Bar Pull is rated 4.5 out of 5 by 30. Rated 5 out of 5 by Judy from The polished nickel drawer pulls are beautiful. This is the... The polished nickel drawer pulls are beautiful. This is the second style of Martha Stewart polished nickel drawer pulls that I have purchased from Home Depot, and they are perfect! They are a great value. Rated 5 out of 5 by HomeDepotCustomer from The handles look great. ... The handles look great.